Creatively inspiring and encouraging people to seek God and serve others. Pilgrims people the outer and inner world of the Chartres Cathedral. 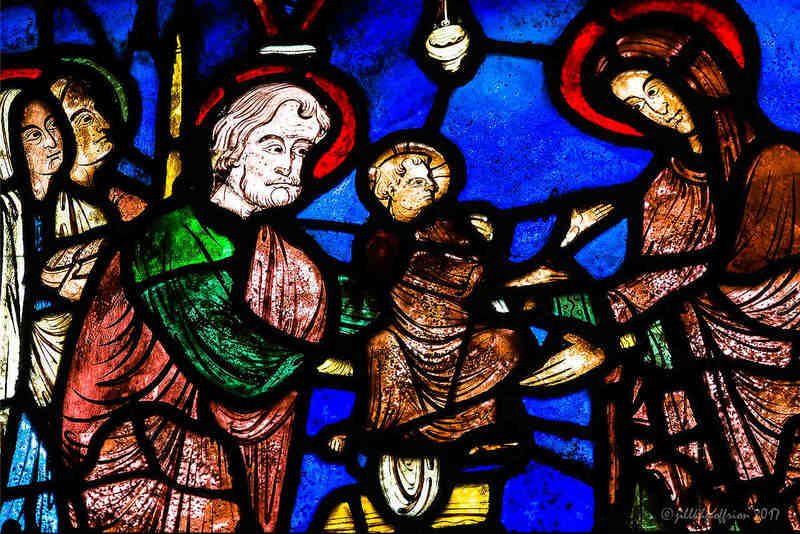 Medieval pilgrims traveled to Chartres for many different reasons. Some came to pray near the sacred relic of Mary’s veil. Many stopped on the way to Compostella in Spain. For some, arriving at Chartres signaled the end of a long promised journey which they dedicated to God. Pilgrims came for sacred reasons, they still do. Pilgrims who came to Chartres, found many companions. Outside, there were sculptures of pilgrims from both Old Testament and New Testament times. Pilgrims could be easily identified by their walking sticks. Once inside the cathedral, pilgrims found many representations of earlier pilgrims in the windows. One of the main reasons that medieval pilgrims came to Chartres was to pray with The Sancta Camisa, the Veil of Mary. In medieval times the relic was not taken out of its reliquary and so many believed that it was a a shirt–there are many depictions of this found throughout the cathedral. A small shirt is still the symbol of the cathedral chapter. The relic, given by Charles the Bald (grandson of Charlemagne who acquired the relic), was in fact a long piece of cloth. This modern icon represents it. Many scholars believe there is a connection between the labyrinth which covers the nave and the pilgrimage purpose of the cathedal. “We should expect that in Chartres of all places, every object in the cathedral should have the same purpose – to help pilgrim find the correct path, to give him Ariadne’s thread to lead him through life’s maze.” See James, John. (1977). “The Mystery of the Great Labyrinth: Chartres Cathedral.” Studies in Comparative Religion 11: 92-115. Many medieval pilgrims starting from points north would walk through Paris and then come to Chartres on their way to Santiago de Compostela. The Chemin de St. Jacques (Spanish Camino) brought many pilgrims to the town and cathedral. Modern day pilgrims to the church where St. James’ relics rest follow shell markers as they make their way south. There are many blue and yellow Chemin (Camino) markers in Chartres. There are a number of contemporary pilgrimages to Chartres. In April, following the example of Charles Péguy, students walk from Paris to Chartres. In May, there is a Tamil pilgrimage. Other smaller pilgrimages organized by local parishes happen on a regular basis. Of course, others come to the cathedral after organizing their own smaller pilgrimages as well. to the embodiment of your hopes. the path that unfolds at your feet. © 2007 Jill K H Geoffrion. Email Jill for permission to copy. Barron, R. (2000). Heaven In Stone and Glass: Experiencing the Spirituality of the Great Cathedrals. New York, Crossroad Publishing Company. A devotional tool to help understand the spiritual nature of the great cathedrals. Each chapter is designed to both teach and inspire. Birch, D. J. (1998). Pilgrimage to Rome in the Middle Ages: Continuity and Change. Rochester, NY, The Boydell Press. “Debra Birch conveys a vivid picture of the world of medieval pilgrims to Rome–the romipetae, or “Rome-seekers”–covering all aspects of thier journey, and thie life in the city itself.” Publisher. Clift, J. D. and W. B. Clift (1996). The Archetype of Pilgrimage. Outer Action with Inner Meaning. Mahwah, NJ, Paulist Press. “…journey towards a better understanding of the meaning and variety of pilgrimages from the insights of Carl Jung.” Paulist Press. Cousineau, Phil. (1998). The Art of Pilgrimage. The Seeker’s Guide to Making Travel Sacred. Berkeley, CA, Conari Press. “…for the traveler who longs for something more than diversion and escape, for those searching for a path with a heart.” Conari Press. Geoffrion, Jill. (2006). 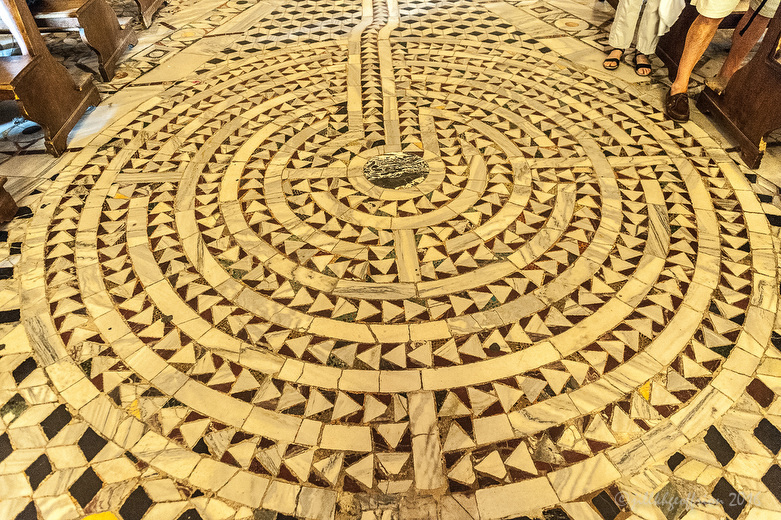 Praying the Chartres Labyrinth: A Pilgrim’s Guidebook. Cleveland, OH, Pilgrim Press. “With a deepening of focus, keen prepartion, attention to the path below our feet, and respect for the destination at hand, it is possible to transform even the most ordinary trip into a sacred journey, a pilgrimage.” Author. Girault, M. e. P.-G. Visage de Pèlerins au Moyen Age: Les pèlerinages européens dan’t l’art et l’épopée. Zodiaque. James, John. (1977). “The Mystery of the Great Labyrinth: Chartres Cathedral.” Studies in Comparative Religion 11: 92-115. Nardo, D. (1996). Life on a Medieval Pilgrimage. San Diego, Lucent Books. A short book about what it was like to be a medieval pilgrim. For a more general bibliography on pilgrimage, click here. Would you like to receive occasional news from Jill about events and publishing projects? Sign up below.